The Custom Device Wizard - a tool to develop faster and better custom devices. We are pleased to announce the latest version of VeriStand real-time testing software, VeriStand 2016. Featuring a new and better way to handle large models directly from the UI Manager, the latest version reduces deployment time and improves execution time. With improved model handling, you can change model parameters without interrupting your workflow. The new model handling engine in VeriStand 2016 efficiently accesses your model parameters only when needed and without having to import them into your system definition file, speeding up your ability to test different scenarios. VeriStand 2016 builds upon the 2015 SP1 release, which announced a completely redesigned UI Manager and ASAM XIL support, and remains the most open and customizable real-time testing software on the market. Learn more about the improvements and what's new. VeriStand 2015 Service Pack 1 features native support for the ASAM XIL API. Customers can now integrate NI hardware-in-the-loop (HIL) systems with third-party HIL systems and reuse test scripts developed for other HIL environments. The ASAM XIL API supports test benches at all stages of software development and testing – MIL, SIL, HIL, and so on. The standard provides an API for the communication between test automation software and real or virtual test benches (XIL systems). See our Visual Studio examples here. In our last blog post, we announced the release of VeriStand 2015 Service Pack 1 (SP1) and the official version of the UI Manager, which allows you to quickly and easily distribute UI elements across many screens and zoom and search to find the data you need while your test is running. Download the free VeriStand 2015 SP1 tutorial here. We’re pleased to announce the latest version of VeriStand, VeriStand 2015 Service Pack 1 (SP1). Featuring a new UI manager, ASAM XIL support, and a host of additional features, it remains the most open and customizable real-time testing software on the market. New UI Manager: SP1 makes developing and running real-time tests better than ever by giving you the ability to quickly create professional-looking user interfaces using the new UI Manager. Completely redesigned from the ground up, it allows you to quickly and easily distribute UI elements across many screens and zoom and search to find the data you need while your test is running. ASAM XIL Support: SP1 features native support for the ASAM XIL API. This helps you integrate NI hardware-in-the-loop (HIL) systems with third-party HIL systems and gives you the ability to reuse test scripts developed for other HIL environments. Now you can choose the right tool for the job without worrying about disrupting your existing workflow. Embedded UI for CompactRIO Support: With the release of SP1, customers running VeriStand on Intel x64-based NI Linux Real-Time controllers can now leverage the Embedded UI for custom plugins called Custom Devices. This allow us, with the ASAM XIL feature to get the most out of the openness of the platform by combining Flexible UI benefits with portability and compatibility of different vendros. In the coming weeks, we’ll share more on the new features of VeriStand 2015 SP1. In the interim, check out the overview video and links below. I am proud to announce the release of VeriStand 2015. With the addition of real-time Linux support, improved model performance and usability, more streamlined hardware integration, and a long list of other new features, VeriStand 2015 is the best VeriStand yet! The VeriStand UI Manager beta is available to download. It is completely free of charge,and it has been completely rewritten based on feedback from many VeriStand users. The UI Manager has been designed with both usability and performance in mind, and it enables you to create very polished HMIs quickly. 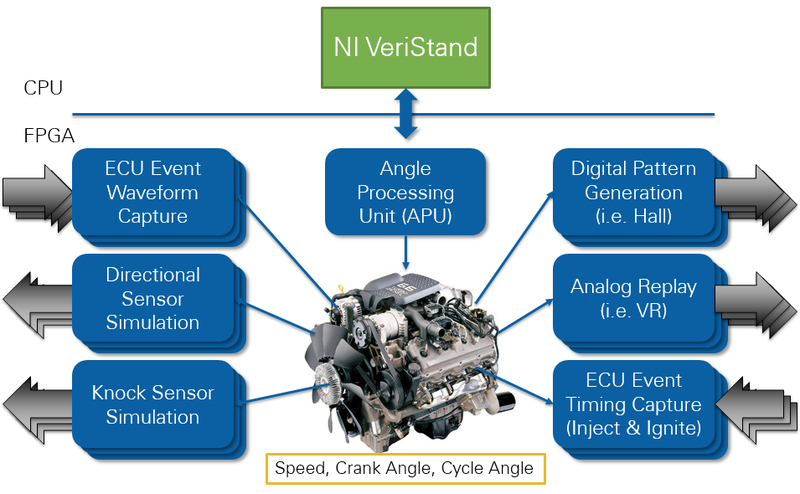 The Engine Simulation Toolkit for NI VeriStand provides a powerful, open-source, configuration-based experience for testing engine control units (ECUs). In NI VeriStand, simply load a LabVIEW FPGA bitfile that includes Engine Simulation Toolkit IP and configure the measurement and generation options. Combine with your own engine physics model to create a complete ECU hardware-in-the-loop system. The FPGA IP library includes examples so novices and experts can transform their NI FPGA hardware into sophisticated ECU testing tools. We have recently added a great new tool to the NI VeriStand Add-Ons Community. The VeriStand FPGA XML Builder Node is a configuration based node which allows the user to specify channels to be sent and received from VeriStand, configure those channels, then automatically generate the necessary XML file for VeriStand. This new tool makes it much easier to build FPGA personalities for NI VeriStand, and it makes it easier to use NI RIO for real-time testing applications. Here is a series of videos that help you get up and running with NI VeriStand. They walk you through configuring various parts of the NI VeriStand system definition. Tula Technology is a revolutionary company that brings in Detroit's automotive expertise with Silicon Valley ingenuity. Their technology, called Dynamic Skip Fire(TM), uses sophisticated engine control systems with advanced digital signal processing in order to get up to 20% fuel economy while maintaining ride quality in today's automobiles. Tula Technology performs real-time testing with NI VeriStand at multiple stages of development to ensure product quality. View the video below to learn more about Tula Technology and see them using NI VeriStand. NI VeriStand 2013 adds a range of functionality to improve the way that you run tests and view test results. In addition to logging data during specific tests in the Stimulus Profile Editor, you can now log data directly from the workspace, and that data can be exported to NI DIAdem, analyzed, and put into a report all with a single click. This ensures that data is presented the same way every time, so that you can easily compare test results. 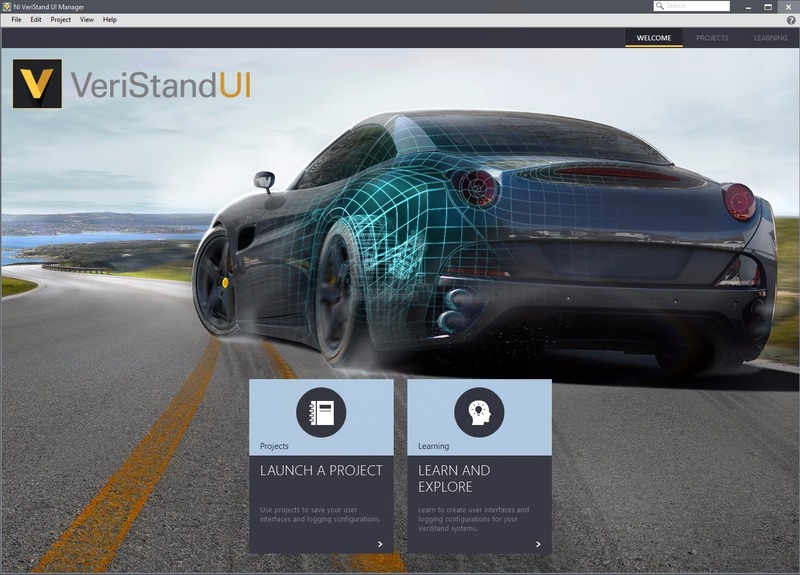 NI VeriStand 2013 also adds an array of new features that streamline simulation model integration and improve real-time execution performance. We are pleased to announce that NI VeriStand 2012 is available. You can use the new version of NI VeriStand to perform high-speed data acquisition and logging and utilize flexible data logging funcitonality find useful data faster during post-processing. The latest release of NI VeriStand also helps you get up and running faster using new hardware configuration utilities such as hardware auto-discovery and channel configuration tools, and NI SC Express integration makes acquiring conditioned measurements easier than ever before. National Instruments has recently released a set of custom step types for NI TestStand that allow you to more easily automate NI VeriStand. The Custom NI VeriStand steps for NI TestStand are designed to make it easier to set up common NI VeriStand actions in NI TestStand. The steps interface with NI VeriStand through NI VeriStand's .NET API's. Some examples of custom steps for NI TestStand include configuring and deploying real-time sequences, programmatically injecting faults, updating model parameters. These custom step types represent many commonly used steps. However, additional custom steps can be added to suit your individual application. Get started with NI VeriStand using this step-by-step walkthrough that takes you through software installation, NI VeriStand project setup, simulation model integration, and also provides a guide for setting up the NI RIO Scan Engine Add-On to NI VeriStand. You can find the Getting Started with NI VeriStand whitepaper at http://www.ni.com/white-paper/14126/en. Watch the video tutorial that shows you how to use the NI VeriStand Stimulus Profile Editor to run, deploy, and undeploy NI VeriStand projects. In addition to enabling you to create sophisticated test sequences that can be run in real-time, the Stimulus Profile Editor can be used to perform test executive functions that include: running macros, replaying data from CSV files, analyzing pass-fail criteria, and generating reports. View the NI VeriStand project control video at: http://www.ni.com/white-paper/14041/en. NI VeriStand 2011 SP1 has been officially released and is currently available for download at http://www.ni.com/veristand/download/. This new release includes over 100 bug fixes and expanded documentation, including additional documentation on APIs for using NI VerStand to communicate with .NET compatible software. Learn more about the new features at: What's New in NI VeriStand 2011SP1. The NI VeriStand Stimulus Profile Editor Tutorial provides instructions for creating sophisticated real-time test scripts, and it adds extensive descriptions of the functionality available in the NI VeriStand 2011 Stimulus Profile Editor. It includes five example scenarios for utilizing key features including looping, branching, multitasking, and pass/fail analysis, and it contains references to example code that can be used to test the functionality built into the Stimulus Profile Editor. National Instruments has recently released a free suite of tools for NI VeriStand that adds J1939 communication functionality for real-time testing. These tools provide the ability to monitor and communicate with any J1939 compliant devices on a CAN network. The functionality of the J1939 tool suite includes the ability to read and write J1939 frames (including frames over 8 bytes) imported from a database, read active and previously active trouble codes, clear active and previously active trouble codes, claim and cache J1939 device addresses, send J1939 requests, and generate raw frames on the network. National Instruments is proud to announce the INERTIA Add-On for NI VeriStand. INERTIA, from Wineman Technologies is a LabVIEW-based, turnkey software for real-time test cell applications that has been in the marketplace for nearly a decade, and it is now available as an NI VeriStand add-on. INERTIA is an NI VeriStand plugin that is specifically tailored to test cell applications such as dynamometers, servo-hydraulic test systems, and environmental test chambers. INERTIA adds out-of-box functionality to NI VeriStand that includes: multi-mode PID control with bumpless mode switching, dither and amplitude control, as well as control loop tuning and alarming. INERTIA also provides a stimulus profile editor designed specifically for test cell applications. The INERTIA stimulus profile editor is built on top of the new NI VeriStand stimulus profile tool. To learn more about the INERTIA Add-On for NI VeriStand, go to the INERTIA Add-On for NI VeriStand page. NI VeriStand 2011 has been officially released! NI VeriStand 2011 provides a new stimulus profile tool for creating real-time test sequences. Test sequences can include numerous structures and functions providing a rich environment for authoring real-time test sequences. Multiple test sequences can be run simultaneously and sub-sequences allow the creation of re-useable libraries. Using these new capabilities, you can also add real-time response analysis for deterministic decision making and pass/fail analysis. In additional to real-time test sequences, the new Stimulus Profiles also include data logging and pre-/post- test deployment utilities that provide a complete set ofready-to-use functionality for create real-time stimulus profiles. Congratulations to the Virginia Tech Hybrid-Electric Vehicle Team! Virginia Tech recently was named the overall winner of EcoCAR: The NeXt Challenge, a three-year collegiate vehicle engineering competition sponsored by the U.S. Department of Energy and General Motors (GM). The Virginia Tech Hybrid Electric Vehicle Team (HEVT) designed and built an extended-range electric vehicle (EREV) that uses E85 (ethanol) and achieves fuel efficiency of 81.9 miles per gallon gasoline equivalent. With National Instruments reconfigurable software and hardware, the team used a graphical system design approach to design, prototype, validate and deploy a control strategy for the vehicle’s hybrid components. The team used NI VeriStand real-time testing software and NI PXI to create a hardware-in-the-loop simulation and validation system that evaluated the vehicle’s fuel and electric energy consumption and tested safety features. There is a great spot on ni.com to provide feedback on the features that you would like to see in NI VeriStand. This is a place where you can post your idea, and other users can vote on that idea. Your feedback can help to drive the future of the product; ideas with a large amount of support will be taken into consideration when deciding on features that go into future versions of NI VeriStand. Install these tools to create NI VeriStand FPGA Personalities more efficiently. The tools include the NI VeriStand FPGA Clock Support library discussed in Creating FPGA-Based I/O Personalities for NI VeriStand as well as an NI VeriStand RIO Library and NI VeriStand Custom FPGA Project Wizard discussed at the link below. Take advantage of NI-XNET hardware interfaces to easily add high-performance, real-time interface for CAN, LIN, and FlexRay networks to your NI VeriStand application.